This guide describes the prerequisites and provides step-by-step instructions to install Red Hat Gluster Storage using different methods. This chapter outlines the minimum hardware and software installation requirements for a successful installation, configuration, and operation of a Red Hat Gluster Storage Server environment. Red Hat Gluster Storage is a software-only, scale-out storage that provides flexible and affordable unstructured data storage for the enterprise. Red Hat Gluster Storage 3.4 provides new opportunities to unify data storage and infrastructure, increase performance, and improve availability and manageability in order to meet a broader set of an organization’s storage challenges and requirements. GlusterFS, a key building block of Red Hat Gluster Storage, is based on a stackable user space design and can deliver exceptional performance for diverse workloads. GlusterFS aggregates various storage servers over network interconnects into one large parallel network file system. The POSIX compatible GlusterFS servers, which use XFS file system format to store data on disks, can be accessed using industry standard access protocols including NFS and CIFS. Red Hat Gluster Storage can be deployed in the private cloud or datacenter using Red Hat Gluster Storage Server for On-Premise. Red Hat Gluster Storage can be installed on commodity servers and storage hardware resulting in a powerful, massively scalable, and highly available NAS environment. Additionally, Red Hat Gluster Storage can be deployed in the public cloud using Red Hat Gluster Storage Server for Public Cloud, for example, within the Amazon Web Services (AWS) cloud. It delivers all the features and functionality possible in a private cloud or datacenter to the public cloud by providing massively scalable and highly available NAS in the cloud. Red Hat Gluster Storage Server for On-Premise enables enterprises to treat physical storage as a virtualized, scalable, and centrally managed pool of storage by using commodity server and storage hardware. Red Hat Gluster Storage Server for Public Cloud packages GlusterFS as an Amazon Machine Image (AMI) for deploying scalable NAS in the AWS public cloud. This powerful storage server provides a highly available, scalable, virtualized, and centrally managed pool of storage for Amazon users. Ensure that your environment meets the following requirements. XFS - Format the back-end file system using XFS for glusterFS bricks. XFS can journal metadata, resulting in faster crash recovery. The XFS file system can also be defragmented and expanded while mounted and active. Red Hat assists existing Gluster Storage Software Appliance customers using ext3 or ext4 to upgrade to a supported version of Red Hat Gluster Storage using the XFS back-end file system. Format glusterFS bricks using XFS on the Logical Volume Manager to prepare for the installation. For information on configuring chrony for time synchronization for all Gluster nodes, see Using chrony. Edit the NTP configuration file /etc/ntp.conf using a text editor such as vim or nano. The Red Hat Enterprise Linux 6 version of this file already contains the required information. Edit the contents of this file if customization is required. Use the ntpdate command for a one-time synchronization of NTP. For more information about this feature, see the Red Hat Enterprise Linux Deployment Guide. Red Hat Gluster Storage Server uses the listed ports. Ensure that firewall settings do not prevent access to these ports. Firewall configuration tools differ between Red Hat Entperise Linux 6 and Red Hat Enterprise Linux 7. Any authorized network entity 49152 - 49664 - All configurations Brick communication ports. The total number of ports required depends on the number of bricks on the node. One port is required for each brick on the machine. For more information regarding the version details of previous Red Hat Gluster Storage releases, see https://access.redhat.com/solutions/543123. Red Hat Gluster Storage supports a number of features. Most features are supported with other features, but there are some exceptions. This section clearly identifies which features are supported and compatible with other features to help you in planning your Red Hat Gluster Storage deployment. Virtual Data Optimizer (VDO) volumes, which are supported in Red Hat Enterprise Linux 7.5, are not currently supported in Red Hat Gluster Storage. VDO is supported only when used as part of Red Hat Hyperconverged Infrastructure for Virtualization 2.0. See Understanding VDO for more information. Features in the following table are supported from the specified version and later. [a] See Section 17.3. Tiering Limitations in the Red Hat Gluster Storage 3.4 Administration Guide for details. Red Hat Gluster Storage can be installed in a data center using Red Hat Gluster Storage Server On-Premise. This chapter describes the three different methods for installing Red Hat Gluster Storage Server: using an ISO image, using a PXE server, or using the Red Hat Satellite Server. For information on launching Red Hat Gluster Storage Server for Public Cloud, see the Red Hat Gluster Storage Administration Guide. Technology preview packages will also be installed with this installation of Red Hat Gluster Storage Server. For more information about the list of technology preview features, see chapter Technology Previews in the Red Hat Gluster Storage 3.4 Release Notes. When you clone a virtual machine that has Red Hat Gluster Storage Server installed, you need to remove the /var/lib/glusterd/glusterd.info file (if present) before you clone. If you do not remove this file, all cloned machines will have the same UUID. The file will be automatically recreated with a UUID on initial start-up of the glusterd daemon on the cloned virtual machines. This chapter details the steps to obtain the Red Hat Gluster Storage software. Visit the Software & Download Center in the Red Hat Customer Service Portal (https://access.redhat.com/downloads) to obtain the Red Hat Gluster Storage Server for On-Premise installation ISO image files. Use a valid Red Hat Subscription to download the full installation files, obtain a free evaluation installation, or follow the links in this page to purchase a new Red Hat Subscription. Visit the Red Hat Customer Service Portal at https://access.redhat.com/login and enter your user name and password to log in. Click Downloads to visit the Software & Download Center. In the Red Hat Gluster Storage Server area, click Download Software to download the latest version of the software. Red Hat Gluster Storage Server for Public Cloud is pre-integrated, pre-verified, and ready to run the Amazon Machine Image (AMI). This AMI provides a fully POSIX-compatible, highly available, scale-out NAS and object storage solution for the Amazon Web Services (AWS) public cloud infrastructure. For more information about obtaining access to AMI, see https://access.redhat.com/knowledge/articles/145693. The installation process launches automatically when you boot the system using the ISO image file. Press Enter to begin the installation process. For some hypervisors, while installing Red Hat Gluster Storage on a virtual machine, you must select the Install System with basic video driver option. The Configure TCP/IP screen displays. To configure your computer to support TCP/IP, accept the default values for Internet Protocol Version 4 (IPv4) and Internet Protocol Version 6 (IPv6) and click OK. Alternatively, you can manually configure network settings for both Internet Protocol Version 4 (IPv4) and Internet Protocol Version 6 (IPv6). NLM Locking protocol implementation in Red Hat Gluster Storage does not support clients over IPv6. The Language Selection screen displays. Select the preferred language for the installation and the system default and click Next. The Keyboard Configuration screen displays. Select the preferred keyboard layout for the installation and the system default and click Next. The Storage Devices screen displays. Select Basic Storage Devices. The Hostname configuration screen displays. Enter the hostname for the computer. You can also configure network interfaces if required. Click Next. The Time Zone Configuration screen displays. Set your time zone by selecting the city closest to your computer's physical location. The Set Root Password screen displays. The root account's credentials will be used to install packages, upgrade RPMs, and perform most system maintenance. As such, setting up a root account and password is one of the most important steps in the installation process. The root user (also known as the superuser) has complete access to the entire system. For this reason, you should only log in as the root user to perform system maintenance or administration. The Set Root Password screen prompts you to set a root password for your system. You cannot proceed to the next stage of the installation process without entering a root password. Enter the root password into the Root Password field. The characters you enter will be masked for security reasons. Then, type the same password into the Confirm field to ensure the password is set correctly. After you set the root password, click Next. The Partitioning Type screen displays. Partitioning allows you to divide your hard drive into isolated sections that each behave as their own hard drive. Partitioning is particularly useful if you run multiple operating systems. If you are unsure how to partition your system, see An Introduction to Disk Partitions in Red Hat Enterprise Linux 6 Installation Guide for more information. In this screen you can choose to create the default partition layout in one of four different ways, or choose to partition storage devices manually to create a custom layout. Choose the preferred partitioning method by clicking the radio button to the left of its description in the dialog box. Click Next once you have made your selection. For more information on disk partitioning, see Disk Partitioning Setup in the Red Hat Enterprise Linux 6 Installation Guide. It is recommended to create a separate /var partition that is large enough (50GB - 100GB) for log files, geo-replication related miscellaneous files, and other files. If a user does not select Create Custom Layout, all the connected/detected disks will be used in the Volume Group for the / and /home filesystems. The Boot Loader screen displays with the default settings. The Minimal Selection screen displays. Click Next to retain the default selections and proceed with the installation. To customize your package set further, select the Customize now option and click Next. This will take you to the Customizing the Software Selection screen. For Red Hat Gluster Storage 3.0.4 or later, if you require the Samba packages, ensure you select the RH-Gluster-Samba-Server component, in the Customizing the Software Selection screen. If you require samba active directory integration with gluster, ensure you select RH-Gluster-AD-Integration component. For NFS-Ganesha select RH-Gluster-NFS-Ganesha. The Package Installation screen displays. Red Hat Gluster Storage Server reports the progress on the screen as it installs the selected packages in the system. On successful completion, the Installation Complete screen displays. Click Reboot to reboot the system and complete the installation of Red Hat Gluster Storage Server. Ensure that you remove any installation media if it is not automatically ejected upon reboot. Congratulations! Your Red Hat Gluster Storage Server installation is now complete. For more information about installing NFS-Ganesha, see Chapter 4, Deploying NFS-Ganesha on Red Hat Gluster Storage. 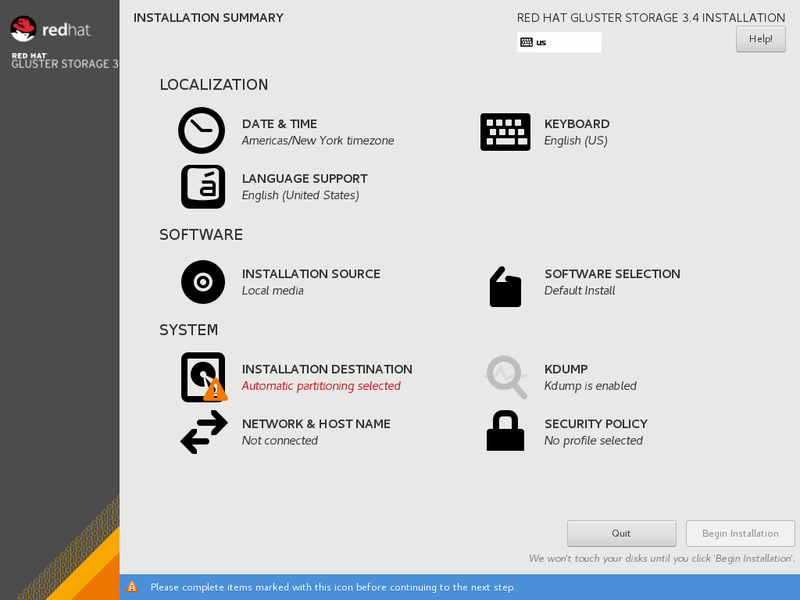 In the Welcome to Red Hat Gluster Storage 3.4 screen, select the language that will be used for the rest of the installation and click Continue. This selection will also become the default for the installed system, unless changed later. Instead of directing you through consecutive screens, the Red Hat Gluster Storage 3.4 installation program on Red Hat Enterprise Linux 7.5 allows you to configure the installation in the order you choose. Select a menu item to configure a section of the installation. When you have completed configuring a section, or if you would like to complete that section later, click the Done button located in the upper left corner of the screen. Setting up NTP is mandatory for Gluster installation. Click Date & Time and specify a time zone to maintain the accuracy of the system clock. Toggle the Network Time switch to ON. By default, the Network Time switch is enabled if you are connected to the network. Click the configuration icon to add new NTP servers or select existing servers. Once you have made your addition or selection, click Done to return to the Installation Summary screen. NTP servers might be unavailable at the time of installation. In such a case, enabling them will not set the time automatically. When the servers are available, the date and time will be updated. To install support for additional locales and language dialects, select Language Support. To add multiple keyboard layouts to your system, select Keyboard. To specify a file or a location to install Red Hat Enterprise Linux from, select Installation Source. On this screen, you can choose between locally available installation media, such as a DVD or an ISO file, or a network location. To configure essential networking features for your system, select Network & Hostname. When the Red Hat Gluster Storage 3.4 on Red Hat Enterprise Linux 7.5 installation finishes and the system boots for the first time, any network interfaces which you configured during the installation will be activated. However, the installation does not prompt you to configure network interfaces on some common installation paths - for example, when you install Red Hat Gluster Storage 3.4 on Red Hat Enterprise Linux 7.5 from a DVD to a local hard drive. When you install Red Hat Gluster Storage 3.4 on Red Hat Enterprise Linux 7.5 from a local installation source to a local storage device, be sure to configure at least one network interface manually if you require network access when the system boots for the first time. You will also need to set the connection to connect automatically after boot when editing the configuration. To select the disks and partition the storage space on which you will install Red Hat Gluster Storage, select Installation Destination. For more information on Installation Destination, see Red Hat Enterprise Linux 7 Installation Guide. After making the necessary configurations, click Begin Installation on the Installation Summary screen. Up to this point in the installation process, no lasting changes have been made on your computer. When you click Begin Installation, the installation program will allocate space on your hard drive and start to transfer Red Hat Gluster Storage into this space. Depending on the partitioning option that you chose, this process might include erasing data that already exists on your computer. To revise any of the choices that you made up to this point, return to the relevant section of the Installation Summary screen. To cancel installation completely, click Quit or switch off your computer. If you have finished customizing the installation and are certain that you want to proceed, click Begin Installation. The Root Password menu item is used to set the password for the root account. The root account is used to perform critical system management and administration tasks. The password can be configured either while the packages are being installed or afterwards, but you will not be able to complete the installation process until it has been configured. Creating a user account is optional and can be done after installation, but it is recommended to do it on this screen. A user account is used for normal work and to access the system. Best practice suggests that you always access the system via a user account and not the root account. After the installation is completed, click Reboot to reboot your system and begin using Red Hat Gluster Storage. Layered install involves installing Red Hat Gluster Storage over Red Hat Enterprise Linux. Red Hat Gluster Storage requires a kernel version of 2.6.32-431.17.1 or higher. This is available in Red Hat Enterprise Linux 6.5 and higher, and in Red Hat Enterprise Linux 7. NFS-Ganesha is not supported on Red Hat Enterprise Linux 6 based installations. Ensure that all packages are up to date by running the following command. If any kernel packages are updated, reboot the system with the following command. To boot your computer using a PXE server, you need a properly configured server and a network interface in your computer that supports PXE. Configure the computer to boot from the network interface. This option is in the BIOS, and may be labeled Network Boot or Boot Services. Once you properly configure PXE booting, the computer can boot the Red Hat Gluster Storage Server installation system without any other media. Ensure that the network cable is attached. The link indicator light on the network socket should be lit, even if the computer is not switched on. A menu screen appears. Press the number key that corresponds to the preferred option. If your computer does not boot from the netboot server, ensure that the BIOS is configured so that the computer boots first from the correct network interface. Some BIOS systems specify the network interface as a possible boot device, but do not support the PXE standard. See your hardware documentation for more information. Ensure that the firewall settings are configured so that the required ports are open. For a list of port numbers, see Section 1.4, “Port Information”. For detailed steps for Satellite, see Red Hat Satellite documentation. Create a new manifest file and upload the manifest in the Satellite 6 server. Search for the required Red Hat Gluster Storage repositories and enable them. Synchronize all repositories enabled for Red Hat Gluster Storage. Create a new content view and add all the required products. Publish the content view and create an activation key. 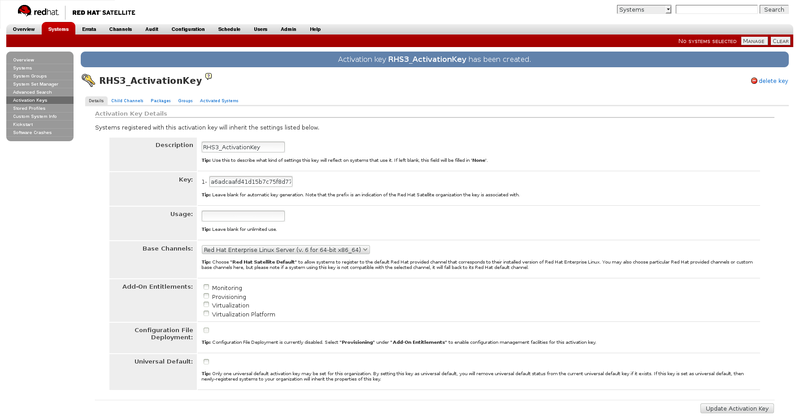 For more information on how to create an activation key, see Activation Keys in the Red Hat Network Satellite Reference Guide. In the Details tab of the Activation Keys screen, select Red Hat Enterprise Linux Server (v.6 for 64-bit x86_64) from the Base Channels drop-down list. For more information on creating a kickstart profile, see Kickstart in the Red Hat Network Satellite Reference Guide. When creating a kickstart profile, the following Base Channel and Tree must be selected. Do not associate any child channels with the kickstart profile. Associate the previously created activation key with the kickstart profile. By default, the kickstart profile chooses md5 as the hash algorithm for user passwords. After creating the kickstart profile, you must change the root password in the Kickstart Details, Advanced Options page of the kickstart profile and add a root password based on the prepared sha512 hash algorithm. For more information on installing Red Hat Gluster Storage Server using a kickstart profile, see Kickstart in Red Hat Network Satellite Reference Guide. # subscription-manager list --available | grep -A8 "Red Hat Enterprise Linux Server"
# subscription-manager list --available | grep -A8 "Red Hat Storage"
Configure the client system to access Red Hat Satellite. Refer section Registering Clients with Red Hat Satellite Server in Red Hat Satellite 5.6 Client Configuration Guide. After installing Red Hat Gluster Storage, the glusterd service automatically starts on all the servers in the trusted storage pool. The service can be manually started and stopped by using the glusterd service commands. For more information on creating trusted storage pools, see the Red Hat Gluster Storage 3.4 Administration Guide: https://access.redhat.com/documentation/en-us/red_hat_gluster_storage/3.4/html-single/administration_guide/#idm140612789187008. Use Red Hat Gluster Storage to dynamically change the configuration of glusterFS volumes without restarting servers or remounting volumes on clients. The glusterFS daemon glusterd also offers elastic volume management. Use the gluster CLI commands to decouple logical storage volumes from physical hardware. This allows the user to grow, shrink, and migrate storage volumes without any application downtime. As storage is added to the cluster, the volumes are distributed across the cluster. This distribution ensures that the cluster is always available despite changes to the underlying hardware. Use the following instructions to manually start and stop the glusterd service. Consult with your IT department to confirm your organization’s supported download instructions for Ansible. gDeploy depends on Ansible to execute the playbooks and modules. You must install Ansible 2.5 or higher to use gDeploy. Native Client is a FUSE-based client in the user space. Native Client is the recommended method for accessing Red Hat Gluster Storage volumes when high concurrency and high write performance is required. For more information regarding installing native client, refer to section Installing Native Client in the Red Hat Gluster Storage Administration Guide. For more information about installing Red Hat Gluster Storage using yum, see Section 2.3, “Installing Red Hat Gluster Storage Server on Red Hat Enterprise Linux (Layered Install)”. Verify if the following packages are installed. To install NFS-Ganesha on Red Hat Gluster Storage you require access to the installation media either through an ISO or a properly configured software repository. 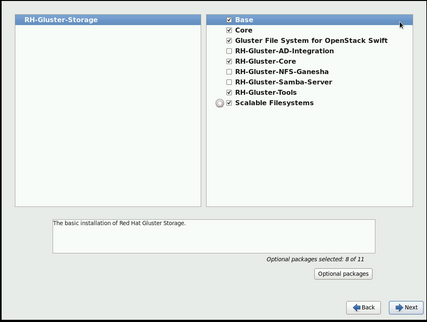 While installing Red Hat Storage using an ISO, in the Customizing the Software Selection screen, select RH-Gluster-NFS-Ganesha and click Next. Proceed with the remaining installation steps for installing Red Hat Gluster Storage. For more information on how to install Red Hat Storage using an ISO, see Installing from an ISO Image. If you are installing using the Red Hat Network or Satellite, ensure that your system is subscribed to the required channels. Red Hat Gluster Storage environment can be set up in a container on a Red Hat Enterprise Linux Atomic Host 7.2. This chapter provides step-by-step instructions for users to deploy containerized Red Hat Gluster Storage on a Atomic Host. You must install one Red Hat Gluster Storage Container per Atomic Host and configure four bricks per Atomic Host. The following table lists the supported versions of Docker and Atomic Host with Red Hat Gluster Storage Server. For information on installing and upgrading to Red Hat Enterprise Linux Atomic Host 7.2, see https://access.redhat.com/documentation/en/red-hat-enterprise-linux-atomic-host/version-7/installation-and-configuration-guide/. A Docker registry provides a place to store and share docker containers that are saved as images that can be shared with other people. With the docker package available with Red Hat Enterprise Linux Atomic Host, you can pull images from the Red Hat Customer Portal. You see what images are available to pull from the Red Hat Customer Portal (using docker pull) by searching the Red Hat Container Images Search Page at https://access.redhat.com/search/browse/container-images. This means that you have successfully downloaded a Red Hat Gluster Storage Image on a Red Hat Enterprise Linux 7.5 Atomic Host and you can use that image. For information on configuring Containerized Red Hat Gluster Storage, see Red Hat Gluster Storage Administration Guide. A software update is a minor release that includes bug fixes for features, software enhancements, etc. Red Hat strongly recommends you update your Red Hat Gluster Storage software regularly with the latest security patches and upgrades. To keep your Red Hat Gluster Storage system up-to-date, associate the system with the Red Hat Network or your locally-managed content service. This ensures your system automatically stays up-to-date with security patches and bug fixes. This is an update between minor releases of the same major product version. If you want to upgrade between major product versions, see Chapter 8, Upgrading to Red Hat Gluster Storage 3.4. Asynchronous errata update releases of Red Hat Gluster Storage include all fixes that were released asynchronously since the last release as a cumulative update. When a Red Hat Gluster Storage server node that hosts a very large number of bricks or snapshots is updated, cluster management commands may become unresponsive as glusterd attempts to start all brick processes concurrently for all bricks and snapshots. If you have more than 250 bricks or snapshots being hosted by a single node, Red Hat recommends deactivating snapshots until the update is complete. After performing inservice upgrade of NFS-Ganesha, the new configuration file is saved as "ganesha.conf.rpmnew" in /etc/ganesha folder. The old configuration file is not overwritten during the inservice upgrade process. However, post upgradation, you have to manually copy any new configuration changes from "ganesha.conf.rpmnew" to the existing ganesha.conf file in /etc/ganesha folder. Make a complete backup using a reliable backup solution before you update your system. This Knowledge Base solution covers one possible approach: https://access.redhat.com/solutions/1484053. Back up to a location that is not on the operating system partition. Ensure that you have sufficient space available for a complete backup. Copy the .glusterfs directory before copying any data files. Ensure that the following configuration directories and files are backed up. Ensure that all extended attributes, ACLs, owners, groups, and symbolic and hard links are backed up. Ensure that no new files are created on Red Hat Gluster Storage file systems during the backup or update process. Restore the backed up content to the newly created thin provisioned logical volume. Offline updates result in server downtime, as volumes are offline during the update process. Complete updates to all Red Hat Gluster Storage servers before updating any clients. The Web Administration update sequence outlined below is part of the overall Red Hat Gluster Storage offline update. Updating Web Administration as a standalone component is not supported. Visit the section Red Hat Gluster Storage Web Administration 3.4.x to 3.4.y and stop all Web Administration services on the Red Hat Gluster Storage servers outlined in step 1 under the heading On Red Hat Gluster Storage Servers (Part 1). Return to this section 7.2. Updating Red Hat Gluster Storage in the Offline Mode and execute the steps outlined under the heading Updating Red Hat Gluster Storage 3.4 in the offline mode. Navigate back to the Red Hat Gluster Storage Web Administration 3.4.x to 3.4.y section and perform the steps identified under On Web Administration Server and On Red Hat Gluster Storage Servers (Part II) to complete the Red Hat Gluster Storage and Web Administration update process. Ensure that you have a working backup, as described in Section 7.1, “Before you update”. Run the following commands on one server at a time. If you want to migrate from Gluster NFS to NFS Ganesha as part of this update, perform the following additional steps. Stop and disable CTDB. This ensures that multiple versions of Samba do not run in the cluster during the update process, and avoids data corruption. Review the packages to be updated, and enter y to proceed with the update when prompted. If updates to the kernel package occurred, or if you are migrating from Gluster NFS to NFS Ganesha as part of this update, reboot the system. When all servers have been updated, run the following command to update the cluster operating version. This helps to prevent any compatibility issues within the cluster. 31305 is the cluster.op-version value for Red Hat Gluster Storage 3.4 Batch 3 Update. Refer to Section 1.5, “Supported Versions of Red Hat Gluster Storage” for the correct cluster.op-version value for other versions. If you want to migrate from Gluster NFS to NFS Ganesha as part of this update, install the NFS-Ganesha packages as described in Chapter 4, Deploying NFS-Ganesha on Red Hat Gluster Storage, and use the information in the NFS Ganesha section of the Red Hat Gluster Storage 3.4 Administration Guide to configure the NFS Ganesha cluster. If you use geo-replication, restart geo-replication sessions when upgrade is complete. You may need to append the force parameter to successfully restart in some circumstances. See BZ#1347625 for details. If you are updating your Web Administration environment, after executing step 9, navigate to the Red Hat Gluster Storage Web Administration 3.4.x to 3.4.y section and perform the steps identified under On Web Administration Server and On Red Hat Gluster Storage Servers (Part II) to complete the Red Hat Gluster Storage and Web Administration update process. In Red Hat Enterprise Linux 7 based Red Hat Gluster Storage, updating to 3.1 or higher reloads firewall rules. All runtime-only changes made before the reload are lost. The SMB and CTDB services do not support in-service updates. The procedure outlined in this section involves service interruptions to the SMB and CTDB services. If geo-replication is in use, complete updates to all slave nodes before updating master nodes. Erasure coded (dispersed) volumes can be updated while in-service only if the disperse.optimistic-change-log and disperse.eager-lock options are set to off. Wait for at least two minutes after disabling these options before attempting to upgrade to ensure that these configuration changes take effect for I/O operations. If updating Samba, ensure that Samba is upgraded on all nodes simultaneously, as running different versions of Samba in the same cluster results in data corruption. Do not perform any volume operations while the cluster is being updated. If you have a replicated configuration, perform these steps on all nodes of a replica set. If you have a distributed-replicated configuration, perform these steps on one replica set at a time, for all replica sets. If this node is part of an NFS-Ganehsa cluster, place the node in standby mode. Wait for any self-heal operations to complete before continuing. Disable the PCS cluster and verify that it has stopped. If you need to update an erasure coded (dispersed) volume, set the disperse.optimistic-change-log and disperse.eager-lock options to off. Wait for at least two minutes after disabling these options before attempting to upgrade to ensure that these configuration changes take effect for I/O operations. Stop the CTDB and SMB services across all nodes in the Samba cluster using the following command. Stopping the CTDB service also stops the SMB service. This ensures different versions of Samba do not run in the same Samba cluster until all Samba nodes are updated. Take note of the packages being updated, and wait for the update to complete. If a kernel update was included as part of the update process in the previous step, reboot the server. If a reboot of the server was not required, then start the gluster services on the storage server using the following command. Verify that you have updated to the latest version of the Red Hat Gluster Storage server. Compare output with the desired version in Section 1.5, “Supported Versions of Red Hat Gluster Storage”. Verify that shared storage is mounted. When all nodes in the volume have been updated, run the following command to update the op-version of the cluster. This helps to prevent any compatibility issues within the cluster. If all servers that host volumes accessed via SMB have been updated, then start and re-enable the CTDB and Samba services by executing the following commands. If SELinux is in use, set the ganesha_use_fusefs Boolean to on. Enable and start the cluster. Release the node from standby mode. Verify that the PCS cluster is running and that the volume is exporting correctly. NFS-ganesha enters a short grace period after performing these steps. I/O operations halt during this grace period. Wait until you see NFS Server Now NOT IN GRACE in the ganesha.log file before continuing. As a result of BZ#1347625, you may need to use the force parameter to successfully restart in some circumstances. If you disabled the disperse.optimistic-change-log and disperse.eager-lock options in order to update an erasure-coded (dispersed) volume, re-enable these settings. This chapter describes the procedure to upgrade to Red Hat Gluster Storage 3.4 from Red Hat Gluster Storage 3.1, 3.2, or 3.3. Upgrading from Red Hat Enterprise Linux 6 based Red Hat Gluster Storage to Red Hat Enterprise Linux 7 based Red Hat Gluster Storage is not supported. Servers must be upgraded prior to upgrading clients. If you are upgrading from Red Hat Gluster Storage 3.1 Update 2 or earlier, you must upgrade servers and clients simultaneously. If you use NFS-Ganesha, your supported upgrade path to Red Hat Gluster Storage 3.4 depends on the version from which you are upgrading. If you are upgrading from version 3.1.x to 3.4, use Section 8.1, “Offline Upgrade to Red Hat Gluster Storage 3.4”. If you are upgrading from version 3.3 to 3.4, use Section 8.2, “In-Service Software Upgrade from Red Hat Gluster Storage 3.3 to Red Hat Gluster Storage 3.4”. Before you upgrade, be aware of changed requirements that exist after Red Hat Gluster Storage 3.1.3. If you want to access a volume being provided by a Red Hat Gluster Storage 3.1.3 or higher server, your client must also be using Red Hat Gluster Storage 3.1.3 or higher. Accessing volumes from other client versions can result in data becoming unavailable and problems with directory operations. This requirement exists because Red Hat Gluster Storage 3.1.3 contained a number of changes that affect how the Distributed Hash Table works in order to improve directory consistency and remove the effects seen in BZ#1115367 and BZ#1118762. In Red Hat Enterprise Linux 7 based Red Hat Gluster Storage 3.1 and higher, updating reloads firewall rules. All runtime-only changes made before the reload are lost, so ensure that any changes you want to keep are made persistently. Back up the following configuration directory and files in a location that is not on the operating system partition. Unmount gluster volumes from all clients. On a client, use the following command to unmount a volume from a mount point. On a gluster server, disable the shared volume. Verify that all volumes are stopped. Unmount the data partition(s) from the servers using the following command. Verify that your system is not on the legacy Red Hat Network Classic update system. If you are still on Red Hat Network Classic, run the following command to migrate to Red Hat Subscription Manager. Then verify that your status has changed. Stop the CTDB and SMB services and verify that they are stopped. If you want to migrate from Gluster NFS to NFS Ganesha as part of this upgrade, perform the following additional steps. Upgrade the server to Red Hat Gluster Storage 3.4. Reboot the server to ensure that kernel updates are applied. Ensure that glusterd and pcsd services are started. If you want to migrate from Gluster NFS to NFS Ganesha as part of this upgrade, install the NFS-Ganesha packages as described in Chapter 4, Deploying NFS-Ganesha on Red Hat Gluster Storage, and use the information in the NFS Ganesha section of the Red Hat Gluster Storage 3.4 Administration Guide to configure the NFS Ganesha cluster. Copy the volume's export information from your backup copy of ganesha.conf to the new /etc/ganesha/ganesha.conf file. Enable firewall settings for new services and ports. See the Red Hat Gluster Storage 3.4 Administration Guide for details: https://access.redhat.com/documentation/en-us/red_hat_gluster_storage/3.4/html/administration_guide/chap-getting_started. Ensure that the /var/run/gluster/shared_storage/nfs-ganesha directory is created. Copy the ganesha.conf and ganesha-ha.conf files, and the /etc/ganesha/exports directory to the /var/run/gluster/shared_storage/nfs-ganesha directory. Update the path of any export entries in the ganesha.conf file. Start the ctdb service (and nfs-ganesha service, if used) and verify that all nodes are functional. If this deployment uses NFS-Ganesha, enable NFS-Ganesha on all volumes. Log in to the Red Hat Network Satellite server. Click on the Systems tab in the top navigation bar and then the name of the old or duplicated system in the System List. Click the delete system link in the top-right corner of the page. To confirm the system profile deletion by clicking the Delete System button. Run the following command on your Red Hat Gluster Storage server, using your credentials and the Activation Key you prepared earlier. This re-registers the system to the Red Hat Gluster Storage 3.4 channels on the Red Hat Network Satellite Server. Verify that the channel subscriptions have been updated. On Red Hat Enterprise Linux 6.7 and higher, look for the following channels, as well as the rhel-x86_64-server-6-rh-gluster-3-samba channel if you use Samba. On Red Hat Enterprise Linux 7, look for the following channels, as well as the rhel-x86_64-server-7-rh-gluster-3-samba channel if you use Samba. 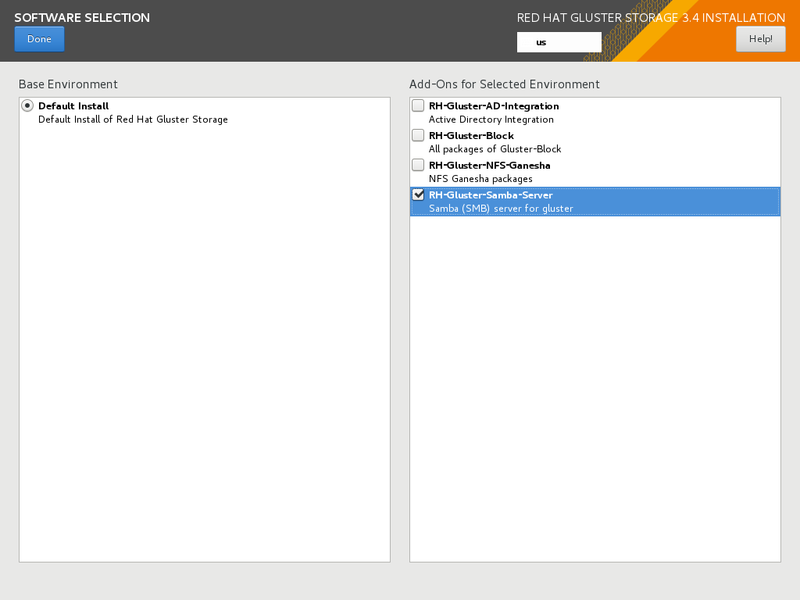 Upgrade to Red Hat Gluster Storage 3.4. Reboot the server and run volume and data integrity checks. 31305 is the cluster.op-version value for Red Hat Gluster Storage 3.4 Batch 3 Update. See Section 1.5, “Supported Versions of Red Hat Gluster Storage” for the correct cluster.op-version value for other versions. Upgrade all Red Hat Gluster Storage servers before updating clients. If you are upgrading from Red Hat Gluster Storage 3.1 Update 2 or earlier, upgrade servers and clients simultaneously. In-service software upgrade refers to the ability to progressively update a Red Hat Gluster Storage Server cluster with a new version of the software without taking the volumes hosted on the cluster offline. In most cases normal I/O operations on the volume continue even when the cluster is being updated. I/O that uses CTDB may pause for the duration of an upgrade or update. This affects clients using Gluster NFS or Samba. Ensure you perform the following steps based on the set-up before proceeding with the in-service software upgrade process. In-service software upgrade is supported only for nodes with replicate, distributed replicate, or erasure coded (dispersed) volumes. If you want to use snapshots for your existing environment, each brick must be an independent thin provisioned logical volume (LV). If you do not plan to use snapshots, thickly provisioned volumes remain supported. A Logical Volume that contains a brick must not be used for any other purpose. If you have a geo-replication session, then to add a node follow the steps mentioned in the sectionStarting Geo-replication for a New Brick or New Node in the Red Hat Gluster Storage Administration Guide. For example, when the server-side quorum percentage is set to the default value (>50%), for a plain replicate volume with two nodes and one brick on each machine, a dummy node that does not contain any bricks must be added to the trusted storage pool to provide high availability of the volume using the command mentioned above. In a three node cluster, if the server-side quorum percentage is set to 77%, bringing down one node would violate the server-side quorum. In this scenario, you have to add two dummy nodes to meet server-side quorum. For replica 2 volumes, disable client-side quorum. This is not recommended for replica 3 volumes, as it increases the risk of split brain conditions developing. Stop any geo-replication sessions running between the master and slave. Ensure the Red Hat Gluster Storage server is registered to the required channels. In-service upgrade for NFS-Ganesha clusters is supported only from Red Hat Gluster Storage 3.3 to Red Hat Gluster Storage 3.4. If you are upgrading from Red Hat Gluster Storage 3.1 and you use NFS-Ganesha, use the offline upgrade method instead. Erasure coded (dispersed) volumes can be upgraded while in-service only if the disperse.optimistic-change-log and disperse.eager-lock options are set to off. Wait for at least two minutes after disabling these options before attempting to upgrade to ensure that these configuration changes take effect for I/O operations. Ensure that the system workload is low before performing the in-service software upgrade, so that the self-heal process does not have to heal too many entries during the upgrade. Also, with high system workload healing is time-consuming. Do not perform any volume operations on the Red Hat Gluster Storage server. Do not change hardware configurations. Do not run mixed versions of Red Hat Gluster Storage for an extended period of time. For example, do not have a mixed environment of Red Hat Gluster Storage 3.3 and Red Hat Gluster Storage 3.4 for a prolonged time. Do not combine different upgrade methods. Upgrading Red Hat Gluster Storage using ISO can be performed only from the immediately preceding release. This means that upgrading to Red Hat Gluster Storage 3.4 using ISO can only be done from Red Hat Gluster Storage 3.3.1. For a complete list of supported Red Hat Gluster Storage releases, see Section 1.5, “Supported Versions of Red Hat Gluster Storage”. Check the peer and volume status to ensure that all peers are connected and there are no active volume tasks. If you need to upgrade an erasure coded (dispersed) volume, set the disperse.optimistic-change-log and disperse.eager-lock options to off. Wait for at least two minutes after disabling these options before attempting to upgrade to ensure that these configuration changes take effect for I/O operations. The following example shows no pending self-heals. In-service software upgrade impacts the following services. Ensure you take the required precautionary measures. When you use Gluster NFS to mount a volume, any new or outstanding file operations on that file system will hang uninterruptedly during in-service software upgrade until the server is upgraded. # service ctdb stop   ;Stopping CTDB will also stop the SMB service. In-service software upgrade is not supported for distributed volume. If you have a distributed volume in the cluster, stop that volume for the duration of the upgrade. The virtual machine images are likely to be modified constantly. The virtual machine listed in the output of the volume heal command does not imply that the self-heal of the virtual machine is incomplete. It could mean that the modifications on the virtual machine are happening constantly. Hence, if you are using a gluster volume for storing virtual machine images (Red Hat Enterprise Linux, Red Hat Enterprise Virtualization and Red Hat OpenStack), then it is recommended to power-off all virtual machine instances before in-service software upgrade. If you have a CTDB environment, see Section 8.2.4.1, “In-Service Software Upgrade for a CTDB Setup”. If the node is part of an NFS-Ganesha cluster, place the node in standby mode. Ensure that there are no pending self-heal operations. Stop all gluster services on the node and verify that they have stopped. Verify that your system is not using the legacy Red Hat Classic update software. If your system uses this legacy software, migrate to Red Hat Subscription Manager and verify that your status has changed when migration is complete. Contact a Red Hat Support representative before migrating from thick provisioned volumes to thin provisioned volumes using in-service software upgrade. For more information, see the Red Hat Gluster Storage 3.4 Administration Guide: https://access.redhat.com/documentation/en-us/red_hat_gluster_Storage/3.4/html-single/administration_guide/#Formatting_and_Mounting_Bricks. The back-end is now converted to a thin provisioned volume. This prevents it starting during boot time, so that you can ensure the node is healthy before it rejoins the cluster. # shutdown -r now "Shutting down for upgrade to Red Hat Gluster Storage 3.4"
Perform this step only for each thick provisioned volume that has been migrated to thin provisioned volume in the previous step. Change the Automatic File Replication extended attributes from another node, so that the heal process is executed from a brick in the replica subvolume to the thin provisioned brick. Create a FUSE mount point to edit the extended attributes. Create a new directory on the mount point, and ensure that a directory with such a name is not already present. Delete the directory and set the extended attributes. Ensure that the extended attributes of the brick in the replica subvolume is not set to zero. Verify that you have upgraded to the latest version of Red Hat Gluster Storage. Ensure that all bricks are online. Ensure that self-heal on the volume is complete. The following example shows a completed self heal operation. If the system is managed by SELinux, set the ganesha_use_fusefs Boolean to on. Verify that the pcs cluster is running, and that the volume is being exported correctly after upgrade. Optionally, enable the glusterd service to start at boot time. Repeat the above steps on the other node of the replica pair. In the case of a distributed-replicate setup, repeat the above steps on all the replica pairs. If you want to enable snapshots, see the Red Hat Gluster Storage 3.4 Administration Guide: https://access.redhat.com/documentation/en-us/red_hat_gluster_Storage/3.4/html-single/administration_guide/#Troubleshooting1. If you disabled the disperse.optimistic-change-log and disperse.eager-lock options in order to upgrade an erasure-coded (dispersed) volume, re-enable these settings. The following sections describe the in-service software upgrade steps for a CTDB setup. Before you upgrade the CTDB packages, ensure you upgrade the Red Hat Gluster Storage server by following these steps. The following steps have to be performed on each node of the replica pair. Upgrading CTDB on all the nodes must be done simultaneously to avoid any data corruption. The following steps have to performed only when upgrading CTDB from CTDB 1.x to CTDB 4.x. All clients must use the same version of glusterfs-fuse. Red Hat strongly recommends that you upgrade servers before upgrading clients. If you are upgrading from Red Hat Gluster Storage 3.1 Update 2 or earlier, you must upgrade servers and clients simultaneously. For more information regarding upgrading native client, refer to section Upgrading Native Client in the Red Hat Gluster Storage Administration Guide. This chapter describes the procedure to upgrade from Red Hat Enterprise Linux 6 based Red Hat Gluster Storage to Red Hat Enterprise Linux 7 based Red Hat Gluster Storage. Red Hat recommends that the RHEL 6 to RHEL 7 upgrade be performed with assistance from Red Hat. Upgrading from RHEL 6 to RHEL 7 is an offline procedure which results in Gluster node downtime, as volumes are offline during the upgrade process. If the system is on Red Hat Network Classic, migrate to Red Hat Subscription Manager using: Migrating from RHN to RHSM in Red Hat Enterprise Linux. If the system is already registered using Subscription Manager, skip the registrations steps and start the backup of the Gluster configuration files. It is recommended to make a complete backup using a reliable backup solution before you update your system. This Knowledge Base solution covers one possible approach: https://access.redhat.com/solutions/1484053. The version number should be 6.10. The preupgrade-assistant is a tool that scans through the existing RHEL 6 system and finds out how fit and ready a system is, to be upgraded to RHEL 7. Make a note of all the components that are marked as Failed and Needs Action. Share the findings with the Red Hat executive assisting with the upgrade process. Migration is not possible with Cluster and HA related packages installed on the system. Visit the Software & Download Center in the Red Hat Customer Service Portal (https://access.redhat.com/downloads) to obtain the latest RHEL 7 ISO image file. Use a valid Red Hat Subscription to download the full installation files, obtain a free evaluation installation, or follow the links in this page to purchase a new Red Hat Subscription. In the Red Hat Enterprise Linux area, click Download Software to download the latest version of the software. The upgrade process is time-cosuming depending on your system's configuration and amount of data. Update the RHEL 7 packages and reboot once the update is complete. The version number should be 7.5. The version number should be 3.4. The output of the command should not list any packages of RHEL 6 variant. If the output lists packages of RHEL 6 variant, contact Red Hat Support for further course of action on these packages. Setup CTDB for Samba, see Configuring CTDB on Red Hat Gluster Storage Server in Setting up CTDB for Samba. You must skip creating the volume as the volumes present before the upgrade would be persistent after the upgrade. For example, the volume name is ctdb_volname, the META="all" in the files should be changed to META="ctdb_volname". Share the volume over Samba as required, see Sharing Volumes over SMB. For more information on geo-replication, see Preparing to Deploy Geo-replication. This section describes the upgrade methods for a Red Hat Gluster Storage and Red Hat Enterprise Virtualization integrated environment. You can upgrade Red Hat Gluster Storage 3.3 to Red Hat Gluster Storage 3.4 using an ISO or yum. Verify that no self-heal operations are in progress. Follow the instructions below to upgrade an integrated Red Hat Virtualization and Red Hat Gluster Storage environment that is online and in-service. Perform the following steps for each Red Hat Gluster Storage node, one node at a time. If you have multiple replica sets, upgrade each node in a replica set before moving on to another replica set. Stop all gluster services on the storage node that you want to upgrade by running the following commands as the root user on that node. In the Administration Portal, click Storage → Hosts and select the storage node to upgrade. Click Management → Maintenance and click OK.
Upgrade the storage node using the procedure at Section 8.2, “In-Service Software Upgrade from Red Hat Gluster Storage 3.3 to Red Hat Gluster Storage 3.4”. In the Administration Portal, click Storage → Hosts and select the storage node. Click the name of the storage node → Bricks, and verify that the Self-Heal Info column of all bricks is listed as OK before upgrading the next storage node. After upgrading all storage nodes, update the client software on all virtualization hosts. In the Administration Portal, click Compute → Hosts and select the node to update. On Red Hat Virtualization versions earlier than 4.2, click Management → Maintenance and click OK.
Click Installation → Upgrade and click OK. The node is automatically updated with the latest packages and reactivated when the update is complete. Subscribe the host to the correct repositories to receive updates. In the Administration Portal, click Management → Activate. Follow the instructions below to upgrade an integrated Red Hat Virtualization and Red Hat Gluster Storage environment that is offline and out-of-service. Using Red Hat Enterprise Virtualization Manager, stop all the virtual machine instances. The Red Hat Gluster Storage volume on the instances will be stopped during the upgrade. Using Red Hat Enterprise Virtualization Manager, move the data domain of the data center to Maintenance mode. Using Red Hat Enterprise Virtualization Manager, stop the volume (the volume used for data domain) containing Red Hat Gluster Storage nodes in the data center. Perform the ISO Upgrade as mentioned in section Section 8.2.1.3, “Configuring repo for Upgrading using ISO”. Re-install the Red Hat Gluster Storage nodes from Red Hat Enterprise Virtualization Manager. Re-installation for the Red Hat Gluster Storage nodes should be done from Red Hat Enterprise Virtualization Manager. The newly upgraded Red Hat Gluster Storage 3.4 nodes lose their network configuration and other configuration details, such as firewall configuration, which was done while adding the nodes to Red Hat Enterprise Virtualization Manager. Re-install the Red Hat Gluster Storage nodes to have the bootstrapping done. You can re-configure the Red Hat Gluster Storage nodes using the option provided under Action Items, as shown in Figure 10.1, “Red Hat Gluster Storage Node before Upgrade ”, and perform bootstrapping. Perform the steps above in all Red Hat Gluster Storage nodes. Start the volume once all the nodes are shown in Up status in Red Hat Enterprise Virtualization Manager. Upgrade the native client bits for Red Hat Enterprise Linux 6 or Red Hat Enterprise Linux 7, depending on the hypervisor you are using. If Red Hat Enterprise Virtualization Hypervisor is used as hypervisor, then install a suitable build of Red Hat Enterprise Virtualization Hypervisor containing the latest native client. Using Red Hat Enterprise Virtualization Manager, activate the data domain and start all the virtual machine instances in the data center. Perform yum update as mentioned in Section 8.1.1, “Upgrading to Red Hat Gluster Storage 3.4 for Systems Subscribed to Red Hat Network”. After upgrading to Red Hat Gluster Storage 3.1, follow the steps mentioned here for SELinux support. These steps are not mandatory and are required only if SELinux support is required. If the system was initially installed without SELinux, particularly the selinux-policy package, one additional step is necessary to enable SELinux. To make sure SELinux is initialized during system startup, the dracut utility has to be run to put SELinux awareness into the initramfs file system. Failing to do so causes SELinux to not start during system startup. Each * (asterisk) character on the bottom line represents 1000 files that have been labeled. In the above example, four * characters represent 4000 files have been labeled. The time it takes to label all files depends on the number of files on the system and the speed of hard drives. On modern systems, this process can take as short as 10 minutes. If SELinux did not deny any actions during the last boot, this command returns no output. The Gluster command line interface (CLI) simplifies configuration and management of the storage environment. The Gluster CLI is similar to the LVM (Logical Volume Manager) CLI or the ZFS CLI, but operates across multiple storage servers. The Gluster CLI can be used when volumes are mounted (active) and not mounted (inactive). Red Hat Gluster Storage automatically synchronizes volume configuration information across all servers. Use the Gluster CLI to create new volumes, start and stop existing volumes, add bricks to volumes, remove bricks from volumes, and change translator settings. Additionally, the Gluster CLI commands can create automation scripts and use the commands as an API to allow integration with third-party applications. Appending --mode=script to any CLI command ensures that the command executes without confirmation prompts. Run the Gluster CLI on any Red Hat Gluster Storage Server by either invoking the commands or running the Gluster CLI in interactive mode. The gluster command can be remotely used via SSH. The peer server status displays. The following is another example, replacing the COMMAND with a command such as help to view the gluster help options. A list of gluster commands and options displays. Various minor corrections for commands, typographical errors, etc. BZ#1659944 - Documented new default value for op-version. BZ#1644480 - Added warnings about glusterd crash. Content updates for Red Hat Gluster Storage 3.4 Batch 1 Update. Copyright © 2015-2019 Red Hat, Inc.